The new homepage of the Global Humanitarianism Research Academy (GHRA) is now online! 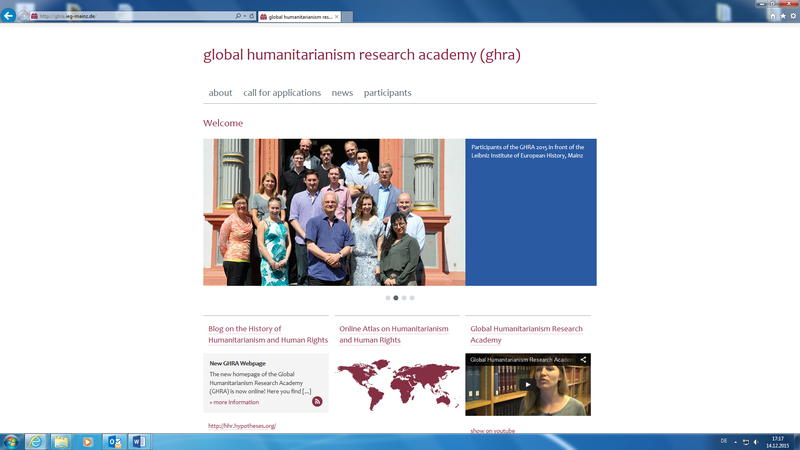 Here you find all news regarding the GHRA such as recent Call for Applications, information on GHRA Participants, the Online Atlas on Humanitarianism and Human Rights as well as YouTube Videos of the GHRA 2015. Keep in mind: The second Global Humanitarianism Research Academy (GHRA) 2016 call for applications closes on 31 December 2015. This entry was posted in Actualités / News, Fellowships/Grants/Jobs, Networks and tagged GHRA, Human Rights, Humanitarianism, ICRC by Fabian Klose. Bookmark the permalink.